Many people used to 3-reel classic slots spend a while deciding whether to try out the 5-reel variety. Click here to play! The Cash Splash 5-Reel slots are a good stepping stone, as the options are kept quite straightforward, meaning players can ease into the cardinal differences between 3-reel and 5-reel slots. First of all, while there are multiple payline, the game is kept simple by using a fixed bet. This means that players only need to decide on how many paylines they wish to play, rather than having to work out how much they will bet on each payline as well. 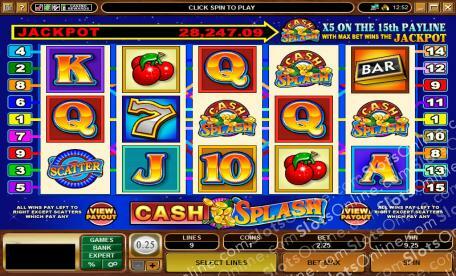 The Cash Splash 5-Reel slots also use the common 3-Reel symbols of BAR, 7s and cherries. Added to this range are common 5-reel symbols, like Ace, King, Queen, Jack, 10, 9, and a pile of money. The highest paying symbol is the Cash Splash Logo and the jackpot can only be won on a maximum bet, just like in the 3-reel variety of this slot. Additionally, the Scatter symbol is introduced to players in its simplest form, as all it does is provide wins on the total bet when enough symbols land on the reels. The Scatter symbol does not trigger special features. Anyone who is only just considering moving to 5-reel slots from classic slots should definitely play the Cash Splash 5-Reel game. With its progressive jackpot and easy interface, this is one of the best introductory 5-reel slots. The special Scatter symbol simply pays out wins on the total bet when 3 or more Scatter symbols land anywhere on the reels. 3 symbols payout 4 times the bet, 4 symbols payout 50 times the bet, and 5 symbols payout 250 times the total bet. The Cash Splash Logo symbol is wild, and substitutes for all symbols except Scatter symbols. Also, the jackpot can only be won by 5 Cash Splash Logo symbols on payline 15.